Mike and I met many years ago. He and I shared the common denominator of incredibly busy lives. Maybe we proved that insanely busy lives see what is necessary and do it no matter how busy lives become. Together we poured our souls into the Bible for a study on how to become better men. On Thursday mornings we would rendezvous at a local Michigan eatery. The food was good. But, the service was even better. All of the wait staff knew Mike. He was like that. People would gravitate toward him as if were a human magnetic. He would introduce me and I would be blessed by more people rubbing shoulders in my life. 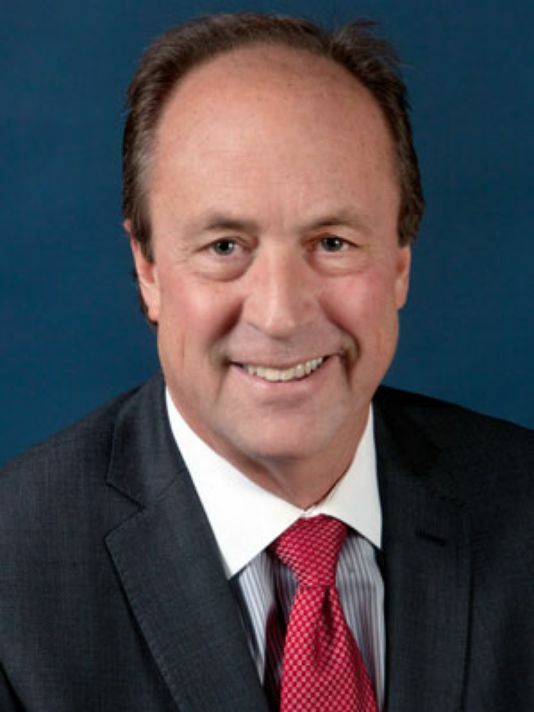 Mike, served others, showed interest in others, gave wise advice, listened a lot, and applied his skills of life where and when he could. As common as snow falling Michigan or humidity rising in Texas, Mike was helping someone, encouraging someone else or guiding another through tough times. Once his company had discovered the perfect location for a radio tower. They needed to send someone to a multi-generational farmer to buy a few acres of his family land so the tower could be built. Who would they send? Mike of course. He pulled on a pair of comfortable blue jeans. Then, he stepped into a pair of Western boots. Now, he was ready to meet a total stranger and buy a piece of his family legacy for a radio station. No one really knows how much time it took. Mike made the sale and a new farming friend. That is how Mike operates: he gets things done and the people involved are all happy. Several times I could grab a piece of Mike’s past and put his history together in my mind. No, he had nothing to hide. He was just very humble about his accomplishments. Humble is a word that I would describe Mike. He never tooted his own horn even though there was a lot to toot about. Yet, his modesty was as much a reflection on how he elevated others. Loyal is another word that describes Mike. He was devoted to his wife, his kids, his friends and to His Savior, Jesus. No matter what trauma visited the lives of others, Mike was there to lend a hand, share a word of cheer or just to put people together who could help one another. All of us who knew Mike are living better lives as a result. He was taken away too early as far as any of us are concerned. But, when God calls us home, He wants us to begin our forever with Him. That for Mike Fezzey is a great final calling. Yet, how I miss my friend. 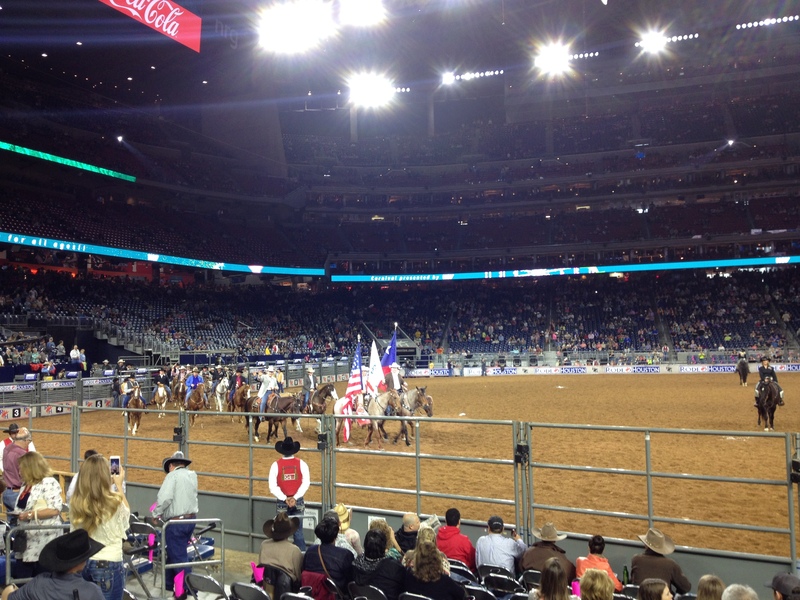 The 2015 Houston Rodeo was in full swing. Saturday was all about the Finals. Champions were being crowned in all of the classic Rodeo events. Not only did the champions perform at their highest level, they were rewarded with the grand prize of $50,000! Thanks some great prize money for these cowboys and cowgirls. Lives were being changed with a single check that came because these winners were two tenths a of a second faster than their nearest competitor. Friends and family were huddled together in the stands cheering on their loved ones until they were hoarse. Tears and hugs were shared all around when the final scores were displayed on the jumbotron. This was the climax of a yearlong season for many of these cowpokes. Yet, everything paused for a special introduction. In a spontaneous moment of an unplanned introduction, the announcer informed the audience that he had just been informed that a special guest had arrived among them. The cameras trained in on the special couple. Nothing in the program gave a hint that he would be a special guest. No script had his name on its list. Camera crews were acting serendipitously. President and Mrs. George H. Bush were in section 110 in the first row, closest to the field. The camera broadcasted their smiles as they pointed at each other and their cheer were sincere and full of joy. The entire stadium was on their feet and applauding with enthusiasm. I was surrounded by people of all ages. Young adults and retired folks as well were all sharing in a special moment of honoring a man who had led them as their President. Guys were whistling and girls were screaming. 41 was smiling and waving to the appreciative crowd. There was no false humility or arrogance in his countenance. I saw a man who loved the people he once led and an appreciative leader who just enjoyed the moment of being admired and loved by the people of Texas. That is a rodeo for you. The people here not only love God, they love their country and the people who serve it. If you miss the love of country and the joy of the God who has blessed our country with extraordinary favor, then go to a rodeo and enjoy it all over again. Spring Break should be a special time of adventure and relaxation for two hard-working teachers. But, this year my bride is burdened with the preparation of her state certification exam and I was in middle of preparing our federal tax returns. At least I had an ace in the whole. For the first time since moving to Houston we were going to the Rodeo. It is billed as the Largest Rodeo in the world. This claim is one that I have means or interest in validating. I just reserved our tickets and looked forward to attending. My time on the internet got us ready with transportation plans via the shuttle system, free parking and discounts on food. What I could not plan was the weather. Rain was the forecast for the day we had tickets to the Rodeo. The precision of this forecast was amazingly accurate. It poured on this gathering of folks. Getting into the stadium was a relief just to get out of the rain and dry off. We were soaked to the bone and thought that a repeated venture was not too favorably received. But, the show began and our interest was piqued. The announcer was in fine form. He was clearly connecting with people who knew about rodeo. At the same time, he also formed a bond with all of us newbies. He introduced a rodeo tradition. It was the Grand Entry. All of the participants rode out into the stadium and received a rousing ovation from the crowd. 70,000 people were beginning to fill the seats. Leading the way into the stadium was a trio of riders. One queen carried the American flag. Another the flag of Texas. Yet a third the Houston Rodeo flag. Once the great cast of riders reached their spots amid great music and fanfare, the announcer introduced the Invocation. One of the participants prayed for God’s blessing, His protection and presence and with gratitude thanked God for His wonderful blessings. He prayed this all in Jesus’ name. There was no apology, no hesitation, no explanation, no equal time for false religions or any protests. It was all done in stride. Faith in the Almighty God was a part of the lives of people at a rodeo. Then the National Anthem was sung. Everyone stood. All of the men removed their hats and caps. People sang with their hands over their hearts. There were no protests, complaints or apologies. God, Country and Family. These three values are embraced and proudly promoted by the Rodeo constituency. I like Rodeo! what are these cattle contemplating? My perch was comfortable and safe. 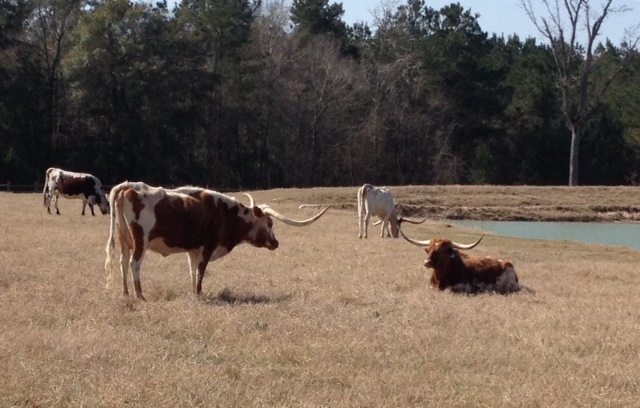 A modern well-running ATV would speed me away from any hard charging Texas Longhorn. All of my experience with these creatures is very limited. Rawhide, the TV black and white cowboy series of cowboys driving herds of beef to the railroad loading points was my first and roughly the limit of my exposures to these fascinating critters. They did not seem nearly as big on the TV screen as they did now that I was in the pasture hanging out with them. Now, they were huge and their horns were massive and seemed incredibly large and pointed in the innocuous direction of anything or anymore who needed a piercing. It was mid afternoon in Texas. 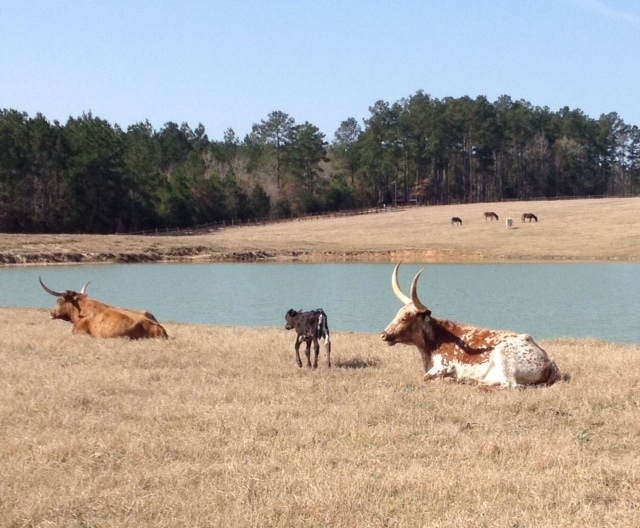 The temperatures were warming up and most of the herd decided to lie down in the pasture and casual chew a cud. One little calf seemed to have different ideas. He is alert and raring to go, while the rest of the herd and his fellow calves yawn at all the noise of a monologue. I loved the life in his little frame. His DNA lay right behind him but what did not yet have in girth he clearly had in a rambunctious spirit. “Now, Penelope, don’t get your tail all in a tizzy. He is your brother. Unless you want him caught of in the roundup and becomes someone’s veal dinner, love him while you have him. Be his best friend. You are family and that counts for a lot more than just a few inconveniences now and then,” her mother mothered. One morning I woke up to an uncomfortable feeling. My throat was itchy. A hacking cough exploded from my lungs. It sounded terrible. Something has found its way into my lungs. Every breathe irritated a build up and stirred a headache causing more coughing. My body was aching. Pain in my head seemed to spread into more pain in my joints, muscles and normal functioning was uncomfortable on its way to being more and more sore. I groped for my cell phone. As comfortable as I could get, I began canceling appointments, rearranging other meetings and contacted key people with whom I needed to meet. For one of those very rare times in my life I sent a note to my office that I would be taking two sick days. Two speaking engagements loomed on the horizon. One was the next day. A second one was not only in three days but it would also require a plane flight to another state. 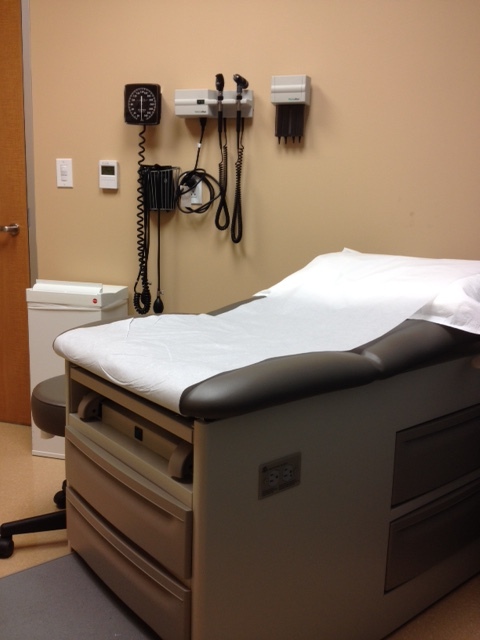 Just to be on the safe side, I called my medical clinic and scheduled a visit to a quick exam. Have not all of us been through enough illnesses to predict how things are going to pan out. I would be worse before I got better and maybe if I went to my doctor early enough then I could get some meds and shortchange the bug that was growing inside of me. Like so many of my machismo brothers we self-diagnose and self-over-the-counter medicate until we break down and go in only to be told that we are getting better. We who are the sick ones know that we are getting better but the doctor’s office said that they had no openings until the next week. This time I was going in before I passed the worst of my illness. My regular doctor was out of the office. They scheduled me with someone what had an opening. I was ushered into the waiting room by the nurse who took all of the preliminaries. Then the P.A. came in. She was friendly, professional and knowledgeable. 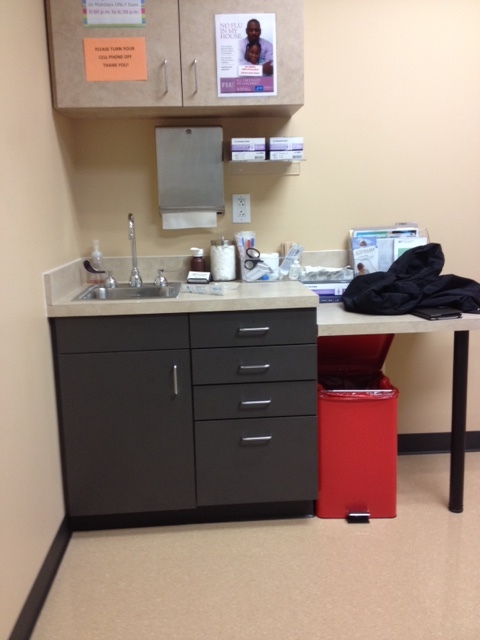 All of the symptoms were discussed and the test results showed no evidence of Flu or Strep. Is it not amazing when serious options are eliminated and I cannot help but be a little disappointed? If it was neither the Flu nor Strep then there was nothing that the doctor could do! Rats, since the medical clinic cannot do anything to help my illness do I really have to fork over the co-pay? Yeah, it is a guy-thing. Each time God moved me from one ministry to the next I made the same petition through prayer. I asked God to give me a love for the city and direct my steps to encourage others and impact the lives of people. Now, He has had me here in Houston for three years. Our prayer was the same. When my bride and I drove in from the West, we asked God to give us a love for the city. As time has progressed we are falling in love with Houston more and more. Each day as I began my hectic schedule I pray again that He would direct my steps to encourage others and impact the lives of people in this fastest growing city in the USA. Over 2,000 people move here every week. 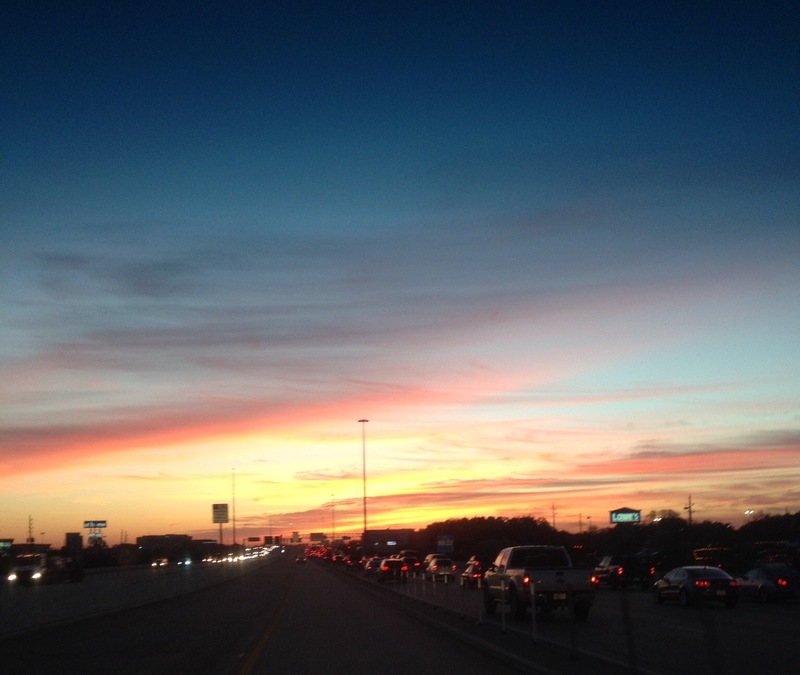 The prosperity of the state and the flourishing business climate of Houston attract thousands. Some of the largest churches in the nation are here in Houston. They span denominational lines as well. When attendance exceeds 2,000 we all stand amazed! Now, each morning my bride and I make our commute into work. 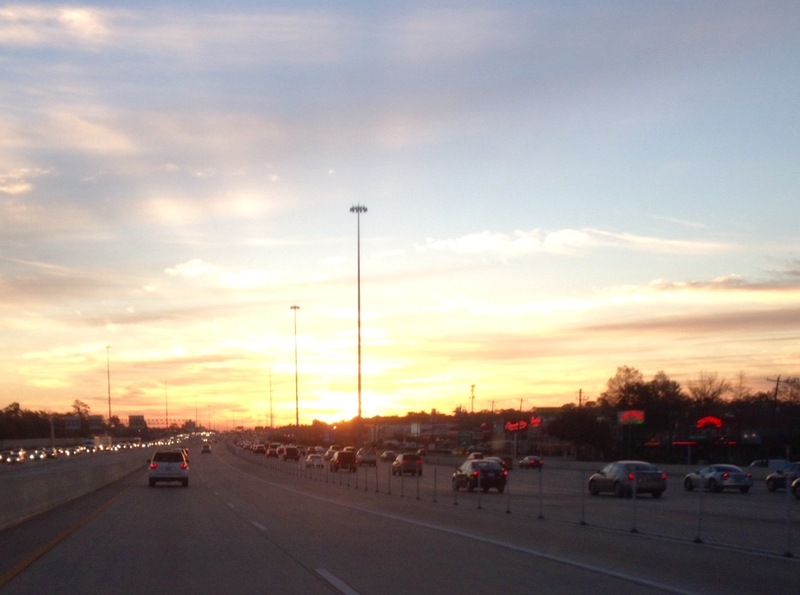 On one of the off ramps we are often greeted with a great view of the Houston skyline. It reminds us to pray for and love this city where so many people reside. In the greater metropolitan area 6 million people call this city their home. Truly this massive population represents a great field that is white and ready for harvest. The Gospel is not just a fad for people who concentrate on talking, this is a place where the Good News is shared and lived out. As the sunrise lights up the city, I rehearse my duties. People fill up my calendar. Students, colleagues, visitors and guests are spaced apart from each other’s appointments so that I can give them the attention that their interests deserve. His brush strokes are colorized, better than the real buildings of colorless concrete and dull building materials. It is as if the Creator is blessing the city with a touch of His creative hand that man cannot come close to matching on his own. That contrast is fine by me. A new beauty is ready to bloom in our city. When the Father decides to bless our city with a special touch of His gracious hand, Houston will forever be changed. Lives will take a new eternal course and the new life in their hearts will spread to family, friends and colleagues all because of love. This special and favorite topic has found its way in my writings many times. It is my favorite time of day. Sunsets are great but if I am forced to choose, I would cast my ballot for a sensational sunrise. When the morning breaks, long before the sun rises I smile and often mouth my greeting, “Good morning, Lord!” It is a reminder of grace. No matter what we failed to do the day before or how we might have messed up or the wrong choices we made, we get a “do-over” with every new day. When it is time, an agreed departure moment on the clock, my bride and I load into our transportation machine. It fires up on command and moves at adjusted speeds just like it was designed to do. Soon we join tens of thousands of other commuters on the asphalt arteries leading into the city. Darkness fades. Other vehicles and buildings along the way come into view. 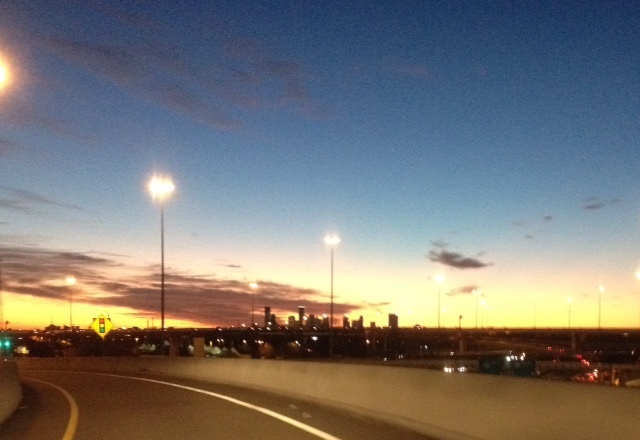 Dawn is upon the city of Houston. Yet, like so many mornings, the rising sun announces its coming with a warm up act. The horizon glows as if a massive fire is spreading across the sky. Brilliant colors mix in perfect harmony not according to fashionistas but according to eternity planned schemes of the spectrum of light. Yellows, oranges, reds and purple blend into each other. All during our route into our destinations, the sky is brightening up. Like the climactic lever controlling the lights on a stage, a masterful performance takes over. This is not about what is to come. No one rushes the presentation. There is no hurry to finish this show. Nor is there ever a boredom because of familiarity. A repeat is never identical. Shades, shadows and sparkle are always in different proportions. It is impossible to be bored with something that is new every morning. The variety defies human understanding and results in human marvel. Beauty from the hand of the Creator never ceases to stir the wonder of the created. The sunrise is the beginning of every new day. Every sunrise is a marvel of God’s creative hand. Each one is new in shades, combination and sensation. Capture the soulful joy of every new day with a one-of-a-kind sunrise. Each one is tailor-made for what the Almighty has customized for the day for everyone who draws breath to live one more day. Bask in His reminder that He starts the day, rules the day and ends the day. No, it is not Chinese. Yes, it is in Chinese restaurants located in the USA. No, restaurants in China do not offer these cookies for dessert. Yet, the iconic fortune cookie makes its way into ethnic lore. Sometimes it appears in movies. Iron Man 3 the Mandarin waxes eloquent on the history of this crunchy tasty morsel. He acknowledges what is generally accepted as true. The ethnic identity is associated with Chinese. Yet, few Americans realize that their assumptions bear little influence on the world stage. Regardless of the real history of this conversation piece the fortune cookie is fun. They offer a tasty end to a delicious meal. Further, they bring most people to a cheerful moment as the evening comes to a close. Recently, I was out with friends. We all ate a delicious Chinese restaurant. The evening was delightful. Our menu was well-balanced. Chicken, fish, pork and tofu gave us our protein. Green string beans, carrots and choy gave us our vegetables. Flavors from Cantonese style foods were delicious. There was a wonderful blend in each of our plates. Rice and noodles soaked up those taste bud sensations and satisfied every hungry soul at our table. 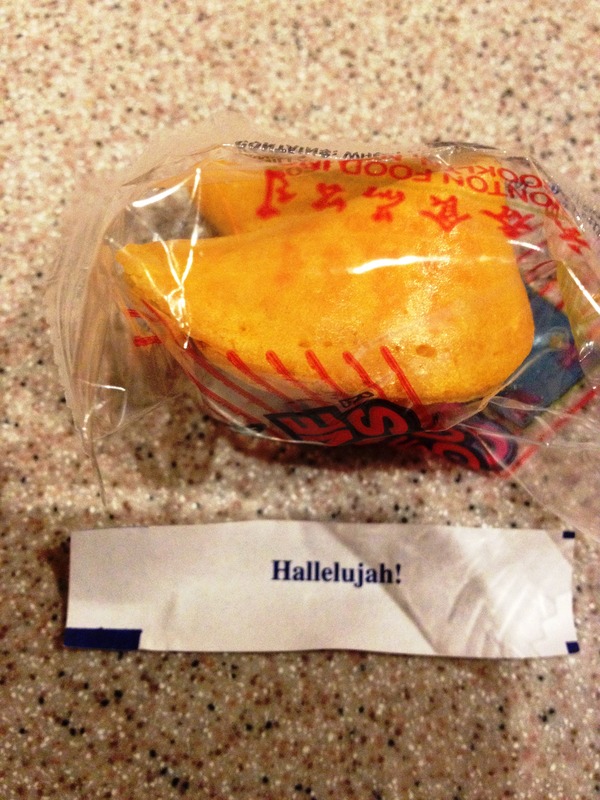 Without a second thought or expectation fortune cookies were delivered with the final bill. We were laughing, joking, reminiscing and doing a lot of talking. Pictures filled the climax of the meal as well. Our gathering of redeemed souls picked up a special enthusiasm. Everyone wanted a cookie to explore “God’s will” and we all laughed. Some of the fortunes were philosophical. A few were nonsensical. That special one-word declaration of “Hallelujah!” was unmatched. It was short, fun and true all at the same time. That after all is what a fortune cookie is all about, eh? People go to libraries for books. They go there to read. Serious visits to specialized libraries is all about research. Who goes to a library because of a view? 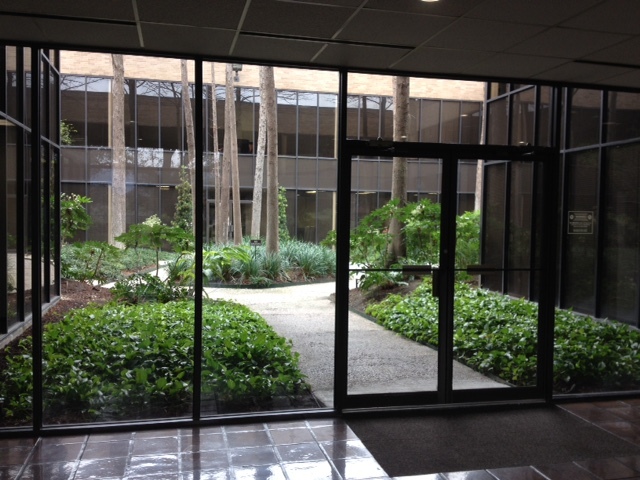 The graduate students of DTS-Houston will come to our new library for a view. Long hours mark every visit to our research destination library. Eyes grow weary, souls tire and spirits need to be revitalized to press on to the next journal, the next volume or the notation corollary. Libraries have beaten many a young scholar into submission. But, with a cheerful environment, excellent climate control and yes, a special view to lift up a person’s eyes and rest the huge task of intellectual research could make the difference between a completed paper or a stirring footnote or a well argued logical presentation. Our new library has that unique element of an outstanding view. 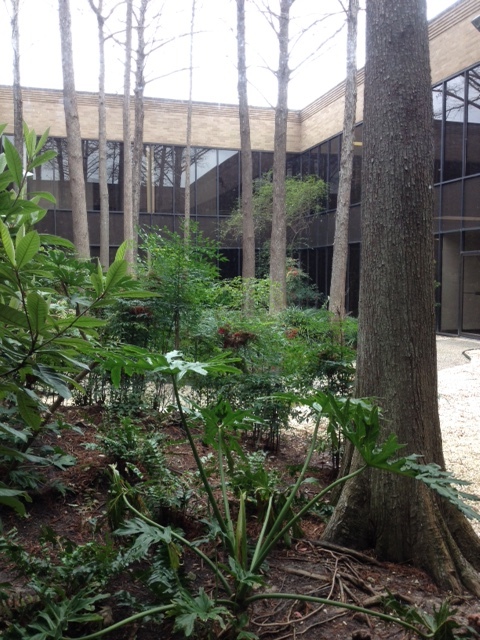 An atrium is at the center of our new campus building. It is decorated with flora that is well designed and beams the textures and shades of life-giving green. Tall tree trunks reach up to the sky that will always point to where our dependence should be. The low-lying shrubs and bushes have variety and balance. Palms show a delicate side of the plantings while also allowing the bark dust on the ground to highlight the color of life. A gravel walk way invites people to come outside and enjoy a stroll around the grounds. This is a protected garden. The well designed building and heavily smoked windows reflect the sky, the garden and the rest of the building. It is an oasis in the middle of busy living. Our seminary campus extension will house only 25% of the facility to start. It is an increase over our last location by thousands of square feet. Parking, interior space and most importantly, a dedicated space for our library mark the improvements in our anticipated campus. Generous donors, vision-driven leadership and talented operations people are making this event happen. It is always expensive to move in this kind of educational scheme. Tuition can not cover the bill. When we put the word out regarding this vision, special people stepped up and wrote out checks. Frugal planners kept the costs as low as possible. Visionaries brainstormed what needed to happen and what needed to stay on the shelves. Now, the vision is becoming a reality. When I saw the view from the library, I could not stop smiling. Our dream of a destination library are coming into view and we are thanking God and loving it!